The paper assesses the strengths and weaknesses of renewable energy (RE) initiatives in Oman. The principal analytical tool is strategic niche management, an approach rooted in evolutionary innovations theory. The analysis of the strengths and weaknesses of RE initiatives is based on three internal dynamic processes: learning processes, actors’ networking, and articulation of visions. This study draws upon secondary data and primary information collected from interviews, with stakeholders representing five selected RE initiatives in Oman. The findings indicate that RE initiatives, if managed properly, can drive large-scale implementation of RE in Oman. There are signs that the networks of actors, although small, are growing. Expectations, although fragmented, are high, positive and diverse. Learning processes do exist but are limited, narrowly techno-economic, and do not encompass social and institutional aspects surrounding new technologies. The paper concludes with policy recommendations to overcome weaknesses observed in studied renewable energy initiatives. Global energy supply, dominated by fossil fuels (coal, oil, and gas), has contributed significantly to the historic increase in anthropogenic greenhouse gas (GHG) emissions [1, 2] and, thus, the observed increase in global average temperature . Global warming, along with energy security issues, has triggered a search for new ways of producing energy, preferably less pollution-generating options. One promising option is renewable energy (RE). RE, if implemented properly, can provide wider economic, environmental, and social benefits such as employment, creation of new sources of income, energy security, and reduction of negative impacts on environment and health . RE does not account for more than 13.8% of the World Total Primary Energy Supply in 2014, but, since 1990, the energy supply from RE sources has grown at an average annual rate of 2.2% . This growth indicates that the real issue is no longer the technical potential of these RE technologies, but how this potential can be realised and substantially contribute to a transformation of the energy sector . To go beyond this share of 13.8% of the World Total Primary Energy Supply in 2014, a range of challenges to RE technology diffusion needs to be addressed. The Gulf Cooperation Council (GCC)—Bahrain, Kuwait, Oman, Qatar, Saudi Arabia, and the UAE—hosts nearly 30% of the proven world crude oil and around one-fifth of global natural gas reserves . Oil and gas remain the most important fuel in the GCC power regime today, accounting for nearly 99% of the electricity supply. Over the period 1971–2014, the total primary energy supply in the Gulf countries grew by 7% per year on average, faster than in any other region in the world . Despite the abundance of renewable energy resources, however, the renewable electricity total installed capacity did not exceed 1% of the total installed power capacity in 2014 [7, 8]. The Arabian Gulf countries are not unaware of the important role of RE in addressing rising energy demands and climate change-related challenges . RE implementation in the Gulf has been initially concentrated in research and administration applications, but recent years have shown that renewables appear poised to move from peripheral applications, such as isolated areas or research sites, to the mainstream utility-scale electricity markets in the region . In this paper, it is argued that it is worthwhile to conduct an analysis of RE development in the Gulf in its early stages to improve the understanding of challenges towards RE implementation from actual practices. Over the last 3 decades, some valuable research has been conducted to understand the challenges and opportunities for RE deployment in the Arab States of the Gulf. A great deal of coverage in the academic and practitioner literature has been extended to technological, economic, and institutional (such as policy, regulatory, and legal frameworks for renewables) aspects of barriers for RE deployment in the Gulf; see, for example, [7, 8, 9, 11, 12, 13, 14, 15]. 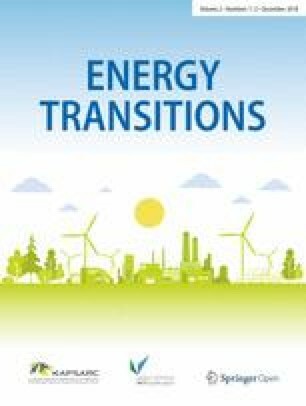 However, the current literature lacks research that applies empirical methodologies to examine the strengths and weaknesses of emerging RE initiatives, providing us with a little insight into the role which these initiatives could play in facilitating a transformation into sustainable energy systems in the context of oil-rich countries. This paper is concerned with assessing the potential role of current RE initiatives in driving the transition towards large-scale implementation of RE in Oman, which is part of the GCC. The interest in investigating the potential for RE development in Oman has started as early as 1995 with scientific research and pilot and implementation projects; see, for example, [16, 17]. A few evaluations have been carried out in the past (e.g., [17, 18, 19, 20]). This paper contributes by applying a systems innovation perspective to emerging RE technologies via strategic niche management (SNM). Rooted in evolutionary innovation theory, SNM suggests that sustainable development patterns1 can be facilitated by creating protected spaces (i.e., niches) that allow experimentation with the coevolution of technology, user practices, and regulatory structures . A core idea behind SNM is learning-by-doing and doing-by-learning to gain insight from experiments to configure whether experiments can replace the incumbent practices in a broader regime . Insights can be gained from niche internal processes such as learning, networking, visioning, and the relationship between niches and global rule sets that guide actor behaviour . This paper is organised as follows: Sect. 2 elaborates on the theoretical and analytical framework for the study; Sect. 3 presents the methodology; Sect. 4 provides a discussion of Oman’s economic, political and energy governance context in which RE initiatives are taking place; Sect. 5 offers a discussion of five RE initiatives selected for analysis in this study and proceeds to offer a detailed analysis of strengths and weaknesses of RE initiatives in Oman in Sect. 6. Finally, Sect. 7 draws conclusions and offers policy recommendations. This paper is concerned with analysing the strengths and weaknesses of renewable energy initiatives. A starting point for approaching this issue is to find an appropriate level of analysis that recognises the diffusion of new, sustainable technologies. Several scholars have investigated how an experimental introduction of sustainable technologies in niche markets can benefit the further diffusion of sustainable technologies. In this paper, three frameworks concerned with addressing the role of niches and innovations in facilitating the uptake of new technologies are discussed. These are transition management [23, 24, 25], technological innovation systems [26, 27, 28], and SNM [22, 29]. These frameworks are discussed in more detail below. The aim of the discussion is to identify their origins, their conceptual details, and their strengths and weaknesses to analyse the degree of success of renewable energy initiatives to promote its large-scale uptake in Oman. Transition management scholars have proposed a practice-oriented model for influencing ongoing processes of shifting systems into more sustainable directions [24, 25, 30]. Their approach aims at developing new modes of governance to manage the complexity of societal systems faced by persistent problems, such as energy problems with anthropogenic climate change . In the transition management approach, visions of the future play an important role in outlining long-term goals. The model suggests engaging diverse societal actors who are establishing policy networks or the so-called transitions arenas such as public–private networks and are forerunners to overcome persistent societal problems in conducting ‘transition experiments’ to learn about and test alternative energy practices and technologies. Four phases can be distinguished in the transition process: the predevelopment phase, during which great deal of experimentation take place but with a little visible change on the societal level; the take-off phase, during which the state of the system begins to shift; the breakthrough phase, in which structural changes take place visibly through an accumulation of socio-cultural, economic, ecological, and institutional changes; and the stabilisation phase during which the speed of societal change decreases and a new dynamic equilibrium is reached . While this policy model is useful for guiding the renewable energy uptake in Oman, it does not offer a detailed analysis of what factors contribute to the success or failure of each transition phase. For example, the predevelopment phase is relevant to this paper in terms of examining the role of renewable energy initiatives in influencing a large-scale uptake of renewables in Oman. However, as the approach stands, the strengths and weaknesses of the renewable energy initiatives cannot be examined to understand the requirements to reach the take-off phase. Research on technological innovation systems (TIS) has emerged as another major line of inquiry in the field of technological diffusion. It is concerned with the emergence of novel technologies and the institutional and organisational changes that go hand-in-hand with technological development . For Carlsson and Stankiewicz , the interplay of firms and other actors in a particular institutional infrastructure is considered the essential driver behind the generation, diffusion, and utilisation of technological innovation . In this regard, Bergek et al. [26, 33] define the three main elements of technological innovation systems as actors, including firms, users, suppliers, investors and other organisations; networks, defined as the channels for the transfer of tacit and explicit knowledge; and institutions, the entities that govern and dictate the environment within which all actors operate. However, one drawback of TIS is its focus on the notion of ‘innovation’ as a starting point for the analysis of innovation systems. As stated by Edquist [34; 182], the main function in system innovation is to pursue innovation processes, i.e., to develop, diffuse, and use innovations. This understanding of the system introduces the following challenge to this paper’s case study. It has been argued that ‘innovation’ sets the goal too high for less-developed countries. As has been argued by Arocena and Sutz , there is no full-blown system of innovation in a less-developed country that can be studied. Rather, the task is to develop strategies to create such a system. Therefore, an innovation system provides a framework for national governments to design national development strategies . Oman is no exception. It is worth noting here that, in Oman, many, if not the majority, of large firms have some type of joint venture arrangements with foreign partners and work under their technological guidance . Most large Omani firms do not have in-house R&D and new technologies are introduced mainly through joint ventures with international partners. There is a little incentive to innovate inside the firm or in cooperation with other smaller firms, R&D entities, or academia. The private sector is perceived as relatively conservative in that many top executives in large companies tend to have a hierarchical, top–down style of management, which does not usually encourage spin-off activities or fruitful subcontracting and linkages between large and small firms, and there is an overwhelming preference to conduct technology transfers through international trade . Accordingly, it is argued that renewable energy technologies are no exception to the process of technology transfer. Since the analysis of technology transfer is beyond the focus of this paper and based on the fact that system innovations do not readily exist in Oman, the innovation system approach is regarded as irrelevant given the aim of this paper. Another line of research that has advanced the idea of active interventions in the field of technological diffusion is SNM. ‘Niche’ is the key concept in SNM approach. Niche acts as an “incubation room” [29, 38] and can be defined as ‘a discrete application domain (habitat) where actors are prepared to work with specific functionalities, accept teething problems such as higher costs and are willing to invest in improvements of new technology and the development of new markets’ . The niche can be an application domain for new technologies, new rules and legislation, new organisations, or even new projects, concepts, or ideas that can develop without being subject to the selection pressure of the prevailing regime . A ‘niche’ is a relevant notion for the representation of emerging RE activities in Oman that are mentioned in the introduction and presented in Sect. 5 (Table 2). Essentially, SNM assumes that if such niches are constructed appropriately, they would act as building blocks for broader societal changes towards sustainable development . Based on a range of empirical studies on socio-technical experiments, such as sanitation , biomass , public transport systems , electric vehicle transport , and energy systems [42, 44], SNM scholars distinguished three internal processes for successful development of a technological niche [21, 29]: (a) learning processes in various dimensions of new technology or technology malfunction and how this can be overcome, market and user preferences, cultural and symbolic meaning, infrastructure and maintenance networks, industry and production networks, regulations and government policy, and societal and environmental effects [21, 29]. Most importantly, the learning processes would contribute more to niche development if they are not only directed at the accumulation of facts and data, i.e., first-order learning but also enable changes in cognitive frames and assumptions, i.e., second-order learning ; (b) the articulation of expectations or visions, which, on the one hand, provide guidance and direction to the internal innovation activities, and, on the other hand, aim to attract attention and funding from external actors; and (c) the building of social networks and the enrolment of more actors, which has the potential to expand the social network and mobilise commitments and resources to contribute more to niche development [21, 45]. These three internal niche processes formulate the basis for the analysis in this paper. The use of the SNM approach in this paper is useful, because it allows an understanding of renewable energy technology diffusion in Oman from a bottom–up perspective, especially by engaging with actors who are associated with the development of such renewable energy initiatives. It furnishes a helpful framework for studying the social issues surrounding the introduction of renewable energy as an unconventional energy source for an incumbent fossil fuel-based energy system. The analysis using the SNM approach is presented in Sect. 6. It is important to pay closer attention to RE initiatives in Oman and improve the understanding of their strengths and weaknesses from actual practices. Oman is selected as a case study in this paper because of its shared characteristics with other Arabian Gulf States as an oil-rich state with a political and economic system that is largely influenced by and dependent on fossil-fuel sources. Unlike its neighbouring countries, Oman is a middle-income country with the smallest hydrocarbon reserves in the region . In fact, the shortage of natural gas reserves in Oman has forced the country to import natural gas from Qatar via the Dolphin Pipeline project since 2008 . In this paper, it is argued that Oman should be amongst the first of the Gulf States to consider urgent development of alternative energy sources to avoid anticipated short-term shortages in its oil and natural gas production. Furthermore, Oman offers a case wherein renewable energy projects are emerging despite the lack of a regulatory framework, which motivates the investigation in this study. Because there has been limited movement in the renewable electricity sector to date, the options for presenting case studies are constrained. The relevant literature on renewable energy is limited. Furthermore, evaluations of the existing renewable energy initiatives are scarce, and most literature was not produced by independent sources. Therefore, fieldwork was undertaken in Oman within a period of seven weeks in spring 2014. Semi-structured interviews with actors representing five out of six selected RE initiatives as well as information gained from secondary data sources were valuable for the analysis in this paper. To what extent are technical and social aspects incorporated in the learning processes? How broad is the actors’ network and to what extent are their interactions regulated? To what extent do the different actors’ visions converge? It is acknowledged that five pilot projects are a relatively small sample. However, at the time of conducting this research, the total number of emerging pilot projects in Oman has been relatively small. Similarly, the total number of interviewees who represent these emerging RE initiatives in Oman did not exceed 7 interviewees. Having a larger number of interviewees were constrained by (1) limitations of the number of experts who can represent such initiatives; or (2) the reluctance of candidates to participate in the interview session; accompanied by (3) the limitation of time and funding allocated to conduct fieldwork in Oman. This small number of interviewees makes it difficult to avoid the interviewees’ bias towards the issues discussed during the interview, because an individual’s opinion can be personal and might not necessarily be representative of the actual role of the organisation. However, to overcome this limitation and to gain further details about pilot projects surveyed in this paper, peer-reviewed journal articles, governmental documents, and newspaper articles were collected. Governmental documents included the Statistical Year Book issued by the National Centre for Statistics and Information; the annual transmission capability statement reports prepared by the Oman Electricity Transmission Company; Annual Reports prepared by the Authority for Electricity Regulation (AER), and the Study on RE Resources (2008) issued by the AER. Presentations delivered by the AER, such as in Cunneen , were requested from interviewees to support the analysis of internal processes (i.e., learning processes, actor networking, and visioning) that lead to the success or failure of surveyed pilot projects. Secondary data were essential at this level of analysis to enhance the completeness of the findings from seven semi-structured interviews, which, in total, result in a small data sample for only five pilot projects. Both primary and secondary data were analysed and structured based on three SNM internal dynamic processes: learning processes, visioning, and actor networking. The analysis of the strength and weakness of each process is guided by a number of criteria. The learning process is considered good when it is (a) broad, i.e., focusing not only on techno-economic optimisation but also on alignment between the technical (e.g., technical design and infrastructure) and the social (e.g., user preferences, regulation, and cultural meaning); and (b) is reflexive, i.e., there is attention to questioning underlying assumptions such as social values and the willingness to change the course if the technology does not match these assumptions . The process of voicing and shaping expectations is considered to be good when (a) an increasing number of participants share the same expectations (expectations are converging) and (b) the expectations are based on tangible results from experiments . Building the social network is considered to be good when (a) the network is broad (including firms, users, policy makers, scientists, and other relevant actors) and (b) when the alignment within the network is facilitated through regular interactions between actors . Before proceeding with the analysis of current renewable energy initiatives in Oman, this section provides a discussion of the context in which renewable energy initiatives are taking place. Like other Arabian Gulf States, Oman’s political economy has been largely influenced by and dependant on fossil energy sources, mainly oil and gas. The political economic regime in the country strongly revolves around the central government, which, unlike advanced industrialised countries, has a role that is more linked to the distribution of oil and gas revenues. In the Arabian Gulf States, energy resources are considered a public good, in which export revenues are shared with citizens through benefits, such as subsidies . The energy sector has been playing a crucial role in economic and political stability of this group of countries. The energy sector thus is highly controlled by the government with a vested interest in fossil fuels and is characterised by a top–down, centralised governance structure. In Oman, the Ministry of Oil and Gas coordinates the government’s role in the energy sector, while the final approval on policy and investments rests with the head of state. It is difficult to draw a line between the public and private sectors that are in charge of developing the energy sector. For instance, Petroleum Development Oman (PDO) accounts for approximately 70% of the country’s crude oil production2 and is 60% owned by the government . It also accounts for nearly all of the natural gas supply in Oman, while the gas transmission and distribution systems are regulated by the Oman Gas Company, which is a joint venture between the Ministry of Oil and Gas (80% of shares) and Occidental Oman (20%). The Oman Oil Company is responsible for energy investments both inside and outside the country and is fully government owned. In the energy sector, the government of Oman owns all or a majority share in all companies associated with the energy industry . One important aspect of this centralised, top–down governance system is the provision of fossil-fuel subsidies. The electricity sector in Oman, for example, can be featured by a double subsidy scheme both on the generation and distribution sides. Electricity generators in Oman purchase their gas requirements from the Ministry of Oil and Gas at a cost of USD1.5 mmBTu, which is much lower than the gas price in the international market . The governmental subsidy that covers the cost difference of purchased natural gas and its price in the international market equals 105.4 million Omani Rials at a cost of USD1.5 per mmBTu and is subject to increases as the cost of gas in the international market increases. Natural gas subsidies can increase fivefold when the price of natural gas in the international market reaches USD9 per mmBTu. On the distribution side, the electricity tariff is highly subsidised and, therefore, is low and does not reflect the real cost of production. The tariff revenues for the Main Interconnected System, for instance, that provides electricity to the half north of Oman account for only 60% of the total economic cost, while the remainder of the 40% of the economic cost of supply is covered through governmental subsidies . Another important aspect of the centralised, top–down governance system is the monopoly in the electricity market. In Oman, the electricity market is regulated by the Authority for Electricity Regulation under a recently reformed sector law. The recently reformed electricity law does not include elements that support the uptake of renewable energy. For instance, Oman’s electricity market features an absence of competition, because network companies such as the Oman Electricity Transmission Company (OETC); distribution companies such as the Muscat Electricity Distribution Company (MEDC), Majan, Mazoon, and the Dhofar Power Company (DPC); and the single buyer and seller of electricity and water (OPWP) are all statutory monopolies established under sector law. Another feature of the new sector law is its explicit prioritisation of fossil-fuel-based technologies. The current electricity law requires the sole power purchase and procurement company in Oman to establish power purchase contracts with developers who generate electricity using the least costly and most technically feasible technologies . The lack of policies supporting renewable energy, centralised energy governance, lack of competitiveness, and high fossil-fuel subsidies formulate major barriers for renewable energy implementation in Oman. However, as will be discussed in the following sections, despite the persistence of these barriers, the implementation of renewable energy projects in Oman is emerging. While the following section describes five selected RE pilot projects developed in Oman over the last decade, Sect. 6 provides an analysis for their strengths and weaknesses to drive the transition towards renewable energy uptake in Oman. This section provides a historical overview of emerging renewable energy development activities in Oman and justifies the selection of five RE initiatives for study in this paper. The interest in renewable energy development in Oman started as early as 1995 and was dominated by academic studies. A total of 92 peer-reviewed journal articles were published in the country between 1995 and 2015 (author’s calculation). Eighty-four percent of scientific research has focused on assessing the technical, economic, and engineering aspects of renewable energy, and is thus predominantly scientific in nature; see, for example, [16, 17]. Three research clusters support the research of renewable energy potential in Oman. These are: the Renewable and Sustainable Energy Research Group (RASERG) at Sultan Qaboos University,3 the Renewable Energy and Sustainable Technology Research Group at Sohar University, and the Renewable Energy Strategic Research Programme by the Research Council.4 While the amount of scientific research has increased over the past 2 decades, there has been relatively less development of pilot projects over the same period (Fig. 1). Evolution of scientific publications in renewable energy and pilot projects between 1995 and 2015. The first renewable energy project was established in 1995 by the Ministry of Water Resources (now the Ministry of Regional Municipality and Water Resources) . As a part of its programme to investigate and assess water resources in Oman, the Ministry installed a solar water desalination plant in the rural area of Heelat Ar Rakah, so that the area could pump and desalinate water from its own well. Given the remote location of the camp, the plant operated using photovoltaic cells; a year later, a 10 kW wind turbine was added to the solar unit to operate the pump . Petroleum Development Oman (PDO) has been proactive in terms of studying the potential for renewable energy investment in Oman and in establishing its own pilot projects. In fact, PDO launched its first renewable energy study in 2000, 8 years before the government initiated its own investigation . The PDO also set a precedent in terms of implementation: the PDO executed its first solar energy pilot project in Oman in 2012 , 2 years before the first governmental pilot project. In 2008, the government launched its first study regarding the potential for renewable energy investments in Oman . The same year, the Authority for Electricity Regulation appointed a consultant to study the technical and economic feasibility of renewable energy implementation in the country. The study recommended the immediate implementation of renewable energy pilot projects. Accordingly, a number of governmental initiatives have been implemented, including an invitation for proposals from both national and international investors to build pilot projects that included wind, solar PV, and CSP. In 2010, six renewable energy pilot projects were shortlisted . However, in 2017, only one pilot project was developed by the Rural Areas Electricity Company, the 303 kW solar project in Al Mazyunah . Nonetheless, this 2008 renewable energy study motivated other local and international actors to investigate the potential for renewable energy investment in Oman. For instance, academics and private investors launched their own pilot projects or experiments to test the technical and economic performance of renewable energy technologies in the specific environmental conditions of Oman. These demonstration projects include academic research (see, for example, [18, 58]), a 6 MW CPV solar technology project, which was built by a private investing company in 2010, and a 50 kW PV rooftop project developed by the Majan company in 2012 . Only five renewable energy initiatives developed between 1995 and 2015 are studied in detail in this paper. The focus of these projects is due to the limited availability of renewable energy initiatives in Oman, representing a newly emerging sector. The five renewable energy initiatives, their development agent, year of development, technology type, aims, and size are presented in Table 2. Four types of renewable energy initiatives can be recognised: government-induced projects, including the 303 kW solar project or Mazyonah project, and the 50 kW PV project or Majan project; projects by national oil companies, such as the 7 MW solar-enhanced oil recovery project; scientific research; and private investors projects, such as the 6 MW concentrator photo voltaic project. In the following section, these four types will be further analysed based on the three indicators of niche dynamic processes: learning processes, actors’ networking, and visioning. This section analyses the strengths and weaknesses of renewable energy initiatives from the perspective of the actors involved on the premise that, if managed properly, renewable energy initiatives are likely to proliferate in the future. This section uses seven semi-structured interviews with representatives from the five selected renewable energy initiatives (see Sect. 3), as well as secondary data sources such as peer-reviewed journal articles, governmental documents, and newspaper articles. It presents the results from the adoption of three concepts of the SNM approach—learning processes, actors’ networking, and visioning (see Sects. 2 and 3)—to the selected initiatives. According to Van der Laak et al. , a learning process is considered good when it is (a) broad, i.e., focusing not only on techno-economic optimisation but also on alignment between the technical (e.g., technical design and infrastructure) and the social (e.g., user preferences, regulation, and cultural meaning) and (b) reflexive, i.e., there is a focus on questioning underlying assumptions such as social values and the willingness to change the course if the technology does not match these assumptions . Based on seven semi-structured interviews conducted in 2014 with representatives of five selected renewable energy initiatives in Oman, it appears that, while the learning processes are diversified, they have been predominantly focused on assessing technical and economic dimensions of renewable energy technological employment. They have not extended this process into social and institutional dimensions to a significant degree, which is observable in all four types of renewable energy initiatives investigated by this paper—i.e., projects established by the government, a national oil company, scientific research, and individual investors. … we want to learn how we can deal with renewable energy in an environment like Oman. Al-Mazyona is an area with high temperatures, sun, desert, dust and is off-grid. We want to learn how to technically, regulatory, legally and financially manage such projects. (Interview 5). As reported from the published articles, Albadi et al.’s  study on the 50 kW solar PV rooftop initiative, for example, focused on determining the engineering standards and realistic constraints of the design to estimate the annual energy output and cost per kWh of electricity generated from a specific PV system. Similarly, the main interest behind the 7 MW solar-enhanced oil recovery (EOR) project was to monitor its performance in steam production and investigate its technological output and dispatch reliability . However, a few interviewed representatives emphasised the importance of gathering data on other dimensions, such as regulatory, policy, and finance-related lessons, along with the technical and economic aspects of technology implementation, which is particularly true of the Al-Mazyona 303 kW solar project (interviews 12 and 13). Social aspects, such as consumers’ acceptance of technologies, do not appear to be given enough attention by the latter project’s representatives. Interviewees indicated their concerns regarding certain institutional challenges that constrain the large-scale implementation of renewable energy technologies in Oman. These include projects’ long-term approval processes (Interview 4) and the high subsidies allocated for the conventional sources of electricity (Interview 7). Others claimed that the aim of the company is to install replicas of the solar project in different areas that belong to the licensed company. However, delays have been experienced in project approval, including the installation of the main project (Interview 4), due to the limited data on the cost and benefits of renewable energy projects, which need to be communicated with the government. In terms of academic research, the scene appears to be different. Academic investigation has shifted the focus from techno-economic aspects towards, albeit narrowly, assessing policy and social aspects of renewable energy adoption in Oman. Between 1995 and 2015, 15 scientific publications expressed concern with the identification of policy instruments that can promote the implementation of renewable energy in Oman (Fig. 2). 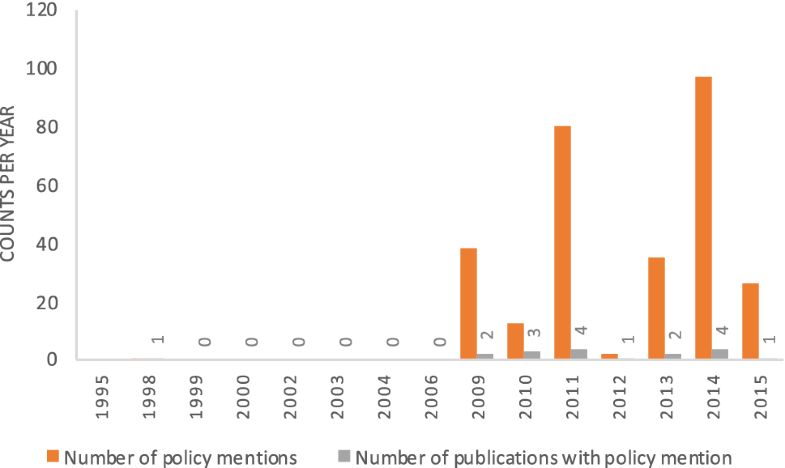 In 2009, for example, a total of seven peer-reviewed journals were produced, and policy was mentioned in only three publications: 13 mentions of policy in , 25 mentions in , and only 3 mentions in . Between 1995 and 2015, only two articles focused on assessing the level of awareness and attitude towards renewable energy in the country, including people’s attitudes towards considering the use of solar thermoelectric refrigerators  as well as governmental awareness of and prevailing attitudes towards renewable energy . Number of publications with a focus on renewable energy policy and number of ‘policy’ mentions per year between 1995 and 2015. According to Van der Laak et al. , social networks are considered good when the network is broad (including firms, users, policy makers, scientists, and other relevant actors). In Oman, despite the short history of renewable energy development, there is an indication that networks of actors in the field of renewable energy are diverse and evolving. The social network started small with research institutes as the main actors; gradually, governmental and private investors have become involved, and the number of actors increased. The diversity of actors’ networks can be reflected in the five analysed renewable energy initiatives. This paper classifies three different spheres of actor networks observable in the five analysed renewable energy initiatives: actor networks at the governmental level (including examples of actors representing the Mazyoonah and Majan projects), actor networks at the oil industry level, and actor networks at the private sector level. These are discussed subsequently. In this first sphere of actor networking at governmental level, as observed in the two governmental-led projects, Majan and Mazyonah, the actors involved in developing these projects enjoyed direct networking with access to governmental financial and technical resources (especially in the Mazyonah project). While the state-owned Rural Areas Company has undertaken full responsibility in the construction of a 303 kW project in the rural area of Mazyonah, its actors are in direct contact with those in the incumbent regime—specifically, actors in the Authority for Electricity Regulation, because the project was established under the AER’s recommendations (interviews 5 and 6). The installation of renewable energy projects by the Rural Areas Company was directly supported by newly established policy regulations that oblige rural area investors to prioritise renewables unless they are proven to be technically or economically unfeasible. In comparison, although it was installed by a state-owned electricity distribution company, representatives of the Majan solar rooftop project have indicated difficulties in receiving approval for the project from the incumbent regime actors in the AER. Project approval was mainly delayed, because there is no element in the power sector law supporting the uptake of renewables, and the licensed electricity distribution companies are not allowed to generate their own electricity or source electricity from any providers other than the sole state-owned electricity provider in the country, Oman Power and Water Procurement company (interview 4). However, the networking of informal actors has created enough influence over governmental actors to allow the approval process to proceed. In the second sphere of actor networks associated with the national oil company, PDO, the 7 MW solar-enhanced oil recovery (EOR) project was established as a joint venture between PDO and its international partner, GlassPoint. The Omani government has been directly involved in the finance of the project through its largest sovereign wealth fund administered by the Ministry of Finance. In 2014, Oman’s general reserve fund pledged US$53 million to support the construction of the project.5 The project has also involved other oil companies, including Royal Dutch Shell, which has a 34% interest in PDO . The third networking sphere represents private investors who have limited resources compared to governmental and national oil company investors. With no renewable energy regulatory framework (the time at which these interviews were conducted), two private investors needed governmental support to receive approval for their projects. The interviewee representing the private sector indicated that it is difficult to influence government decision-making regarding the uptake of renewable energy in Oman (interview 7). There is ample evidence that the aforementioned network spheres have interacted with each another. In 2013, for instance, the Public Authority for Electricity and Water (governmental level) and the Research Council (research level) planned to develop a strategic renewable programme using a grant of eight million Omani Rials—despite delays in launching this programme (Interview 2)—to enable a building resource capacity in the field of renewable energy. Similarly, actors involved in building the Majan 50 kW PV project and the project developers of the Mazyonah 303 kW solar project (governmental-led projects) indicated the existing interaction with academics at a local university in the early stages of project planning and assessment (Interviews 4 and 2). Moreover, there is an indication that actor networks are evolving. A notable example of this is the Oman Power and Water Summit (Determining the Future of Oman’s Renewable Energy Sector), which was held in May 2013. The summit offered a platform for sharing knowledge between actors representing different domains such as academia, business, utilities, and government. This knowledge-sharing platform has maintained momentum through the annual occurrence up to 2018. Other emerging networking platforms include, first, the Renewable Energy Series organised by the Oman American Business Centre in partnership with Shams Global Solutions (SGS) and Dii Desert Energy (Dii), with the aim to connect local companies in the supply chain with international developers bidding on Oman’s large solar independent power producer (IPP) projects ; second, EU-GCC Clean Energy Technology Network-led events such as the PDO-EU-GCC Clean Energy Technology Network workshop, which was held in Muscat in December 2017 and brought together project developers, financial institutions, technology leaders, industry advisers, financial experts, government representatives, policy makers, and entrepreneurs to debate the key challenges; and third, opportunities for Solar PV Rooftop business in Oman  and GlassPoint Innovation Spur, which is the first renewable energy incubator in Oman, established via coordination between GlassPoint, the Research Council, Innovation Park Muscat, Riyada, and Sharaka, which aims to support Omani renewable energy innovators . However, social networks among renewable energy interest groups cannot be considered mature due to a lack of coordination in their ongoing efforts. As suggested by Van der Laak et al. , a social network is considered good when alignment within the network is facilitated by regular interactions between actors. In Oman, however, as reported by interviewee 6, “…there is no good cooperation (everybody is working by himself)” (Interview 12). This can be explained by the lack of leadership in coordinating the ongoing efforts in the field of renewable energy in Oman. The entity that can leverage and regulate the uptake of renewable energy in Oman is still unclear. Three different entities play a potential role in leveraging and coordinating the emerging renewable energy sector in Oman: the Public Authority for Electricity and Water (PAEW); the Authority for Electricity Regulation (AER), which is the regulator of the electricity sector in Oman; and the Ministry of Environment and Climate Affairs (MECA). In the PAEW, a renewable energy department was established in 2013 to study the potential use of renewable electricity generation in Oman; enhance collaboration with international consultants, such as the International Agency for Renewable Energy (IRENA) and the Japanese Agency for International Cooperation (JICA); implement renewable energy pilot projects in coordination with other governmental entities; prepare national energy strategies; and enhance cooperation between renewable energy-focused entities in Oman . AER, on the other hand, has been proactive in releasing the first renewable energy policies in Oman, including a rural area renewable energy policy  and a rooftop solar PV installation scheme (in Arabic Sahim) [78, 79]. Despite its newly established renewable energy department, MECA plays a marginal role in promoting the uptake of renewable energy in Oman, because the new renewable energy department aims to survey the existing renewable energy projects, increase awareness of the advantages of renewable energy development, and encourage the installation of renewable energy projects through Clean Development Mechanism (CDM) activities under the United Nations Framework Convention on Climate Change . The process of voicing and shaping expectations is considered good when (a) an increasing number of participants share the same expectations (expectations are converging) and (b) the expectations are based on tangible results from experiments . In Oman, the ongoing renewable energy initiatives were initiated for various reasons. Each sphere of actors—i.e., projects established by the government, a national oil company, scientific research, and individual investors—seem to work independently. For instance, the expectations of the first renewable energy pilot initiative, a 7 MW project established in 2013 (see Table 2, Sect. 5), were high and positive. The project intended to reduce the consumption of natural gas used for the operation of Enhanced Oil Recovery by the PDO and to increase the company’s profit by freeing more gas for either export or use in other sectors, such as power generation or other domestic industrial activities . Due to tangible and more reliable results from the first phase of the project, the project has been expanded to produce 1 GW of thermal energy in 2017 . Another example is the initiation of the 303 kW solar project in Al-Mazyona, which was recommended by the Governmental Authority for Electricity Regulation (AER) following the outcomes of the first governmental study on renewable energy potential in Oman . The main aim of the project was to test the feasibility of the technology in Oman’s environmental conditions, which has elements such as dust, humidity, and high temperatures (see Sect. 5). The project researchers have also sought to learn from other dimensions, such as regulatory and financial aspects; the building of the necessary know how will allow for further expansion of the project in other areas (Interviews 1, 5, and 6). This move was partially motivated by the awareness of the increasing energy demand in Oman and the desire to reduce the pressure on domestic natural gas supplies to meet these demands. Due to high expectations, the next project in line, a 500 kW wind-based pilot project based in the rural island of Masirah, has been already approved by RAECO. The purpose of installing these pilot projects is to replace diesel-based facilities with renewable energy technologies, either to meet new demand or for further expansion of any existing facilities . Similarly, the third initiative, a 6 MW CPV technology project established by a private company, also sought to test the technical feasibility of renewable energy technologies in Oman’s environmental conditions and the potential for investing in renewable energy in Oman. However, this project also acted as a trial to convince the government to harness available solar energy resources. The motivation for the building of the fourth project stemmed from the interests of the developing company’s CEO in investing in renewable energy technology to meet their electricity needs, as well as the desire to act as a model for renewable energy implementation in Oman (interview 4). Moreover, academic research has focused on renewable energy since 1995, long before the first governmental study on renewable energy in 2008. Scientific research was driven by the objective of identifying potential resources and renewable energy technologies in Oman, as well as by the awareness of increasing energy demands in Oman. Since the interviews took place in 2014, a few renewable energy projects and policy initiatives have been approved. In May 2017, a policy initiative, known as ‘Sahim’ in Arabic, was launched [78, 79]. This new policy initiative allows individuals such as homeowners to install rooftop solar PV systems to produce solar electricity for use and surplus sale to electricity distribution companies. Furthermore, a Power Purchase Agreement was signed in September 2017 for the first utility-scale 50 MW wind-based renewable project in southern Oman [81, 82]. In October of the same year, these two initiatives were followed by an announcement of a national renewable energy target that aims to source 10% of the total electricity generation capacity from renewable energy sources by 2025 . A week after the announcement of a 10% renewable energy target, a consortium of international consultants was appointed to advise on the development of Oman’s first utility-scale 500 MW solar project . However, these recent developments do not appear to intersect or to have been fully articulated, which is, in part, due to immature social networking between the actors involved in these renewable energy initiatives, and there appears to be no widely supported strategy for future market development. In Oman, despite the dominance of a political trajectory characterised by centralised, top–down governance, high fossil-fuel subsidies, low electricity tariffs, and the absence of a national strategy for renewable energy development, several renewable energy initiatives have recently emerged. This paper analysed the strengths and weaknesses of such initiatives to drive the transition towards a renewable energy uptake in Oman. Drawing from seven semi-structured interviews with representatives from five selected renewable energy initiatives and secondary data sources and using the three processes of the SNM approach—learning processes, actor networking, and visioning—this paper showed signs that renewable energy initiatives, if managed properly, can play a role in driving the transition towards large-scale implementation. There are signs that the networks of actors, although they started small, are diverse, and the number of actors is increasing. With high and positive expectations, numerous renewable energy projects have been developed and expanded. Expectations have been diverse, which can be considered normal for emerging niches. However, the convergence of expectations is yet to occur. The third process, learning, is focused on techno-economic learning. The renewable energy development actors in Oman have not been sufficiently able to move beyond these learning dimensions. For example, learning about institutional barriers such as fossil-fuel subsidies or the social acceptance of renewable energy appears to be missing, although indications of their importance have been articulated. Interestingly, there has not been a single ‘niche manager’ who has managed the three social processes taking place in different renewable energy initiatives. However, a certain degree of SNM does exist in government-led initiatives, which appears to be the main driver towards the future uptake of renewable energy in Oman. Only after the governmental release of the renewable energy study in 2008 followed by the establishment of a government-led pilot project in 2014, the first renewable energy policy, i.e., rooftop solar PV installation policy, was launched in 2017 as well as the approval of new projects such as the utility-scale 50 MW wind-based project and utility-scale 500 MW solar-based project. Although private investors have been proactive in introducing the implementation of renewable energy technologies in Oman even before government-led projects began, such as the 6 MW CPV solar project in 2010, private investors played a minor role in influencing the uptake of renewable energy at the national level. Similarly, the initiatives led by the national oil company remain to be developed to exclusively serve the company’s needs. To expand the network of actors. The analysis of five renewable energy initiatives showed that there are four types of actors involved in renewable energy development: academics, government, private investors, and a national oil company. A note of concern is that financing actors and energy consumers (e.g., governmental, commercial, industrial, and household consumers) appears to have been scarcely involved at the core of actors’ networks. The network of actors can be expanded through organising different platforms, regular meetings, and symposia. Diversifying the network of actors is essential to extending the focus of current learning processes from techno-economic dimensions to include social and institutional dimensions. Learning about the latter dimensions is especially important in the context of Oman, whose economy is highly reliant on fossil fuels. For instance, high fossil-fuel subsidies, a low electricity tariff from the conventional energy sources, and long-term approval processes are major barriers that need to be addressed by such learning processes (see Sect. 6). Importantly, developing a platform that enables sharing lessons, while also monitoring results and experiences from different experiments is an important condition for successful niche development. The third process; expectations, while being high and diverse, do not converge, especially with the lack of national renewable energy development strategy. The recent release of the national renewable energy target to source 10% of electricity from renewable energy sources by 2030 opens a window of opportunity for the government to align different actors’ expectations to reflect on longer term visions. It is, however, important to acknowledge the differences between the actors’ ideas and expectations and not force the formulation of a vision to allow more room for diversity and enable learning from different options. While successfully managing internal niche processes is critical, niches alone cannot induce sustainability transitions. Opening up regimes for up-scaling experiments is another important variable. Therefore, studying the barriers and opportunities embedded in an incumbent energy regime with which niches interact is essential to complement the study of a renewable energy transition in Oman, which is the focus of our forthcoming paper. Sustainable development in this paper refers to the definition in the Brundtland Commission Report of 1987: development that meets the needs of the present without comprising the ability of future generations to meet their needs . About Petroleum Development Oman (PDO): http://www.pdo.co.om/en/about/Pages/default.aspx. Renewable Energy Strategic Research Program: https://home.trc.gov.om/tabid/1140/language/en-US/Default.aspx. See the GlassPoint website: https://www.glasspoint.com/markets/oman/. Acknowledgements and gratitude are due to the interviewees for their kind contribution to this research. Thanks to Prof. Joanna Lewis, Dr. Raghu Garud, and Dr. Leah Stokes for their thoughtful and stimulating feedback on the first draft of this paper presented during ETH PhD Academy on Sustainability and Technology, June 2014, Zurich, Switzerland. Additional thanks to Dr. Michael Mason for reading and giving feedback on a second draft of this paper. We confirm that the work in this paper has no conflict of interest. Interview 1: Academic, Sultan Qaboos University 10.02.14. Interview 2: Energy policy specialist, Petroleum Development Oman 11.02.14. Interview 3: Academic, Sultan Qaboos University, 17.02.14. Interview 4: Chief executive officer, Majan Electricity Distribution Company, 03.03.14. Interview 5: Renewable energy section head, Rural Areas Electricity Company, 10.03.14. Interview 6: Head of system planning section, Rural Areas Electricity Company, 10.03.14. Interview 7: Managing partner, Advanced Business Solutions, 11.03.14.